The James Burn USA ProCrease-M is a manual channel creasing machine designed to prevent cracking in toner based digitally printed graphics. 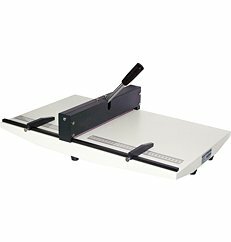 The ProCrease-M features an all metal construction and two magnetic paper stops to assure exact position of each crease location on repetitive jobs. Preventing toner cracking can be the difference between a successful job and defective products that are returned, machines like this can be the key to your finishing success. If you have any questions or are interested in purchasing the James Burn USA ProCrease-M, visit us at SpiralBinding.com. We have great pricing on a full line of Creasing Machines. Call us at 1-800-631-3572 for more information!